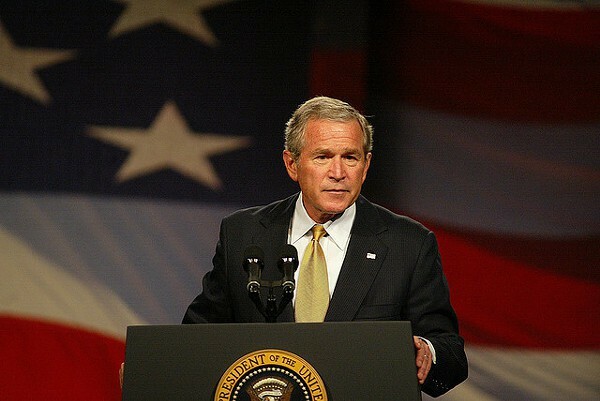 George W. Bush’s ideological war in Iraq. Even during the Vietnam War, the disinformation that flowed from the White House was never so spectacular, so multitudinous – and so effective – as the unceasing Newspeak from the Bush White House now. About effectiveness, the polls say that a lot of Americans, for instance, still think that Iraq had a connection to the terrorist attacks on Sept 11, 2001. The same is true about Iraq’s supposed weapons of mass destruction and about the “mushroom-cloud” imminence of Baghdad’s threat to national security. The president and his chorus put all these delusions into America’s head. They swore that these bogus stories were true in order to frighten the voters and Congress into supporting their invasion of Iraq in March 2003. How did we get into the habit of tolerating such serial, public proclamations of falsehoods? Remember the cute story about George Washington and the cherry tree? Now, with the new President George, the confession line reads a little differently: “I cannot tell the truth.” Indeed, if mendacity statistics were being kept by some national agency, this presidency would surely have set new records. The president says flatly: “The United States doesn’t torture.” That’s ridiculous, laughable. The accepted definition of torture regarding prisoners captured in a war, which is what President Bush was talking about, is “degrading” physical or psychological treatment that causes extreme pain or debilitating injuries — or death. Under that definition, United States has already acknowledged many cases of torture in Iraq and convicted and sentenced a number of soldiers for their abuses. Indeed, if the president’s false statement of torture purity were true, we would be the first nation since the beginning of recorded time whose military forces have not committed acts of torture during the brutality and insanity of war. I have covered wars close-up. Everyone who has been in wars knows that torture is inevitable, a given. The only difference between warring parties is that some armies have strong rules against torture and others have softer discipline or no rules at all. The President says our security now requires that we relax our rules against torture. He doesn’t put it that way; he makes it sound benign and squarely in the humane tradition. Many people believe him. He has apparently persuaded them that changing our laws will not make us more like the terrorists we are fighting now, who lop off heads and display the acts on television. The President has swept aside the argument from many American field officers that if we allow interrogations to go beyond the rules, our own soldiers when taken prisoner will be handled more brutally. He declares that those who raise such issues are dealing in “hypothetical questions” which he says he will not respond to. He also dismisses the contention of military men who have been in war that harsh torture rarely produces reliable information. Senator John McCain of Arizona is one of those military men. As a navy pilot in the Vietnam War, he was shot down over Hanoi and tortured severely at Hoa Lo prison, known to Americans as the “Hanoi Hilton.” Eventually, as did most prisoners subjected to intense physical beatings, McCain gave a false confession, testifying that he had deliberately bombed North Vietnamese schools and hospitals. The taped confession was played over prison loudspeakers for the purpose of humiliating him. It was also broadcast over Hanoi’s military radio station. It was all lies, the usual product of torture. So John McCain, a Republican like the President, knows about torture. And the President does not. McCain and two other Republican senators at first stood up against the President’s legislation relaxing the rules against torture. But under political pressure, McCain and his group reached a “compromise” with the White House — and the bill was enacted in 2006 by the then GOP-controlled Congress. It’s a whitewash that allows the CIA to use harsh tactics on prisoners behind a cloak of secrecy — with no accountability to the public. Secrecy continues to be a commandment in the Bush administration. Secrecy and the inability to tell the truth. First published September 24, 2006 in The Village Voice.